Without a doubt this article was an absolute hoot to write. I had the most fun researching the subject, buying an iPhone app, photographing my toy stuffed hedgehog, writing the article, reading press releases about Nintendo’s 3DS (it had only just been announced when I was writing this). In fact, doing everything except, you know, actually watching any 3D TV (we don’t have a telly, let alone a 3D one). 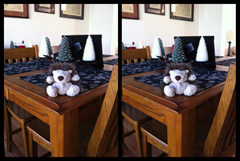 In the article I quickly explain what a 3D effect is and how it works (each eye sees something slightly different and the brain reconstructs it into a three dimensional view), and then run through some of the standard ways people have devised in order to show two slightly different images to the eyes. We have the cyan-red system – and I have some anaglyph lenses for my glasses since there are many images online that can be viewed with such glasses – and the polarized system and the active system and the parallel barrier system used by said Nintendo device. I also point out the problem with all 3D systems: the eyes are focusing on a plane (the image or the screen) and yet the 3D effect is done through convergence. No wonder you can get headaches from watching 3D movies: the brain and the eyes are doing something that we’ve not trained them to do. (Again click to enlarge.) 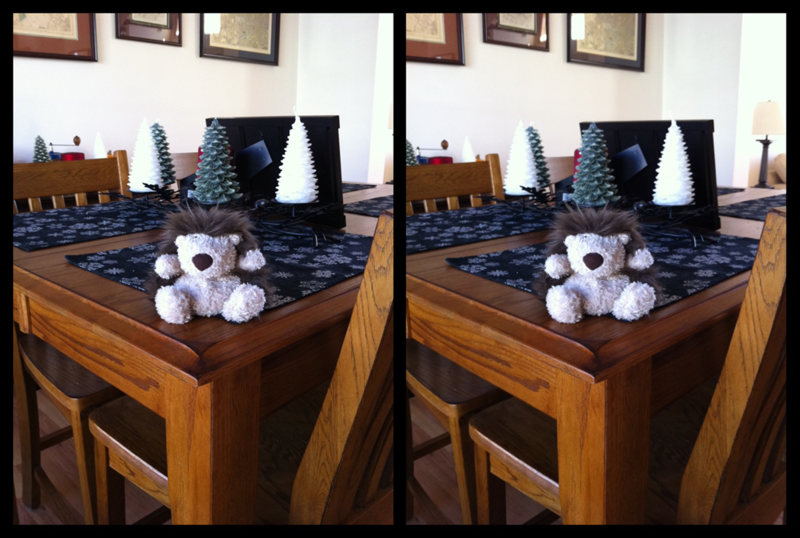 For this one, the left image is supposed to be viewed by the right eye, and the right image by the left. In other words, cross your eyes when looking at the composite image and slowly uncross them. If you do it gently the double-double image will come together into a 3D view in the middle. 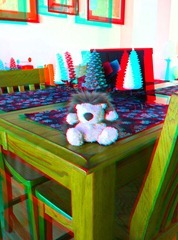 The iPhone app I used was this one: 3D Camera by Juicy Bits Software. I used a tripod to balance the iPhone on, otherwise it gets a bit finicky. (You have to take an image for the left eye, move the iPhone about 3 inches to the right, and then take a picture for the right eye. ) 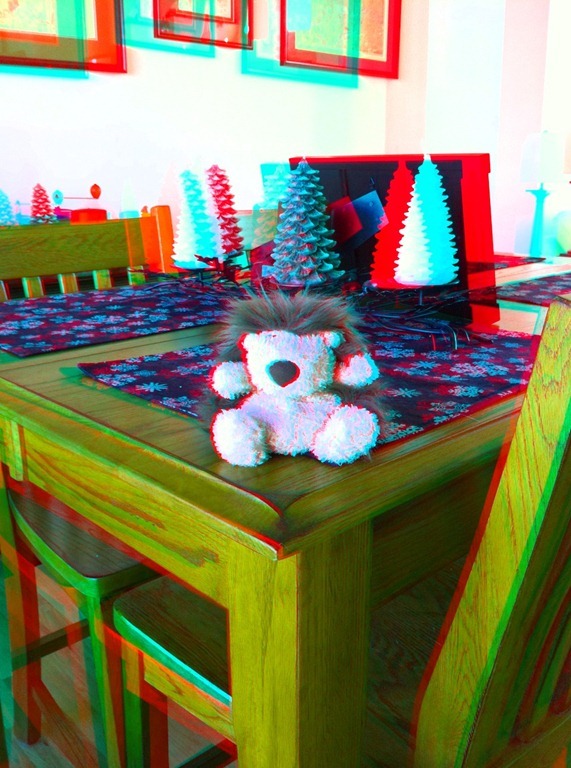 Anyway, well recommended for playing around with 3D images. The stereograms come out really well, I think. Fascinating addendum: mid-April we went to Paris so that my wife could run the Paris Marathon. We were there six days, so we visited a couple of museums and art galleries, including the Louvre. For the exhibit on Leonardo da Vinci’s Virgin and Child with Saint Anne, we rented the audio guide. It came installed on a Nintendo 3DS with extra information and images encoded in 3D on the device (the guide was sponsored by Korean Air, if I recollect). Quite fun: it was the first time I’d actually used one and the first time I’d seen the parallel barrier method in action. This article first appeared in issue 306, April 2011.